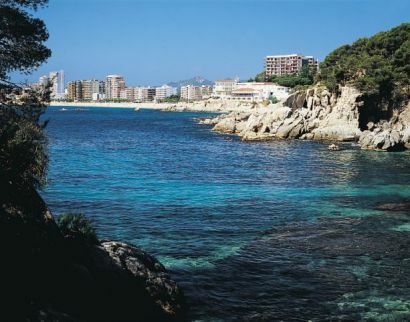 Traveling north up the coastline from S'Agaro and Cala Sa Conca, you will arrive at Platja d'Aro. Its beach of fine golden sand is more than two kilometers long. This excellent and enormous beach is at the sea end of a wide valley dividing the mountains of les Gavarres and Sant Feliu. This valley of singular beauty, is thickly populated, with concentrations in the small villages of Castell, Fanals and Santa Cristina, as well as further towards the sea, by modern groups of chalets on the pine-covered valley slopes. Entertainment spots installed in different places in Platja d'Aro's urban area provide quality night life in the peek of the summer season. The route from Girona, which from Llagostera becomes the main road towards Barcelona, runs the length of the valley to join with the coastal route from Sant Feliu to Palamos. 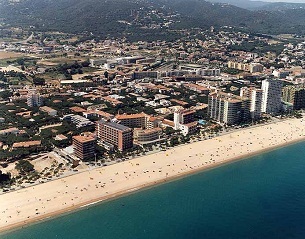 The city of Platja d'Aro, has grown at a sensational rate lately, and is situated right at the crossroad of these two routes. Among the recommendable excursions from Platja d'Aro, you should definitely not overlook a visit to the villages from the valley; to the popular spring Font Picant de Belloc; to Solius, further inland, where the valley narrows and to Romanyl, a magnificent point from which a splendid panorama can be overlooked. You will see to the west, the wide plain of the Selva and Montseny; to the east, L'Emporda stretching towards the Pyrenees. One of the biggest and best preserved dolmens in Catalonia can be admired at Romanyl. It is the Gavarres range, where it drops down into the sea, which cuts off the Platja d'Aro beach forming 5 kilometers of steep cliffs. You can find here a series of coves and rocky promontories offering a really varied and attractive scenery: Treumal, Comtat Sant Jordi, Roques Planes, Cristus. This is one of the most-visited sections of the Costa Brava. Among night-clubs that are in surprising contrast with the old traditions of this region, there are many fine and luxurious hotels as well as numerous chalets.